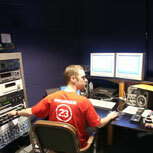 Patrick designs and mixes sound for film, TV, radio, web and audio-visual media. He delivers broadcast quality mixes in any format at affordable rates and on time. He’s easy to work with, creative, experienced and efficient with dialogue editing and mixing, narration, ADR, foley, final mixes and M&E tracks. Patrick was the speaker on 5.1 surround sound at the 2004 DV Expo West. Patrick also composes scores and creates original soundtracks - for info on these services, click here. Philippe Diaz‘s indelible documentary film tracing the growing gap between 1st and 3rd world economies. The trailer for Laurent Firode’s upbeat romantic comedy. Trailer for Louise Hogarth's moving documentary about an AIDS orphanage in South Africa. ITVS trailer for Joyce Lee's insightful animated short film about an immigrant family. This has both sound design and original music. Download - A clip from Mauricio Chernovetzky and Arlene Muller’s short film about Hebraic Mysticism. Download - A confrontational moment from Jon Moritsugu’s insightful feature. 'Funny' from If You See Kay by Bed on Bricks. mr. bowsher rocks! it was great working with him and i'm very pleased with the SCUMROCK (feature) sound design and mix.